It’s that time of year again when thoughts turn to the festive season and the inevitable office Christmas party. Whether it’s actually held in the office or in the local pub, the work’s “do” can often elicit a strong reaction, ranging from excitement, to dread and everything in between. However, how do Christmas parties affect business and is it time to rethink them? Before we look at the drawbacks of the office Christmas party, we should outline the benefits. One of the main upsides to organising some type of office Christmas event is that it gives employees something to look forward to and acts as a “reward” for hard work throughout the year. Taking both of these in to consideration, Christmas parties can therefore can really help to boost morale. Especially during the colder months when getting up for work can be particularly hard. 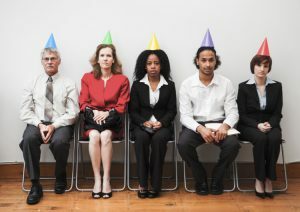 Another major benefit to office parties is that they help to create a stronger bond between employees. Ice breakers and group work can only go so far and sometimes there’s nothing better than allowing colleagues to bond in a non-work environment. A greater degree of familiarity between staff can improve team work, boost efficiency and lead to a much more congenial workplace. I hate to channel Scrooge but we need to talk about the drawbacks and potential pitfalls of hosting a Christmas event for employees. Of course, one of the main considerations for these events is cost- especially for companies that employ many people. It’s very easy for the budget to blow up when you have to pay for venue, food, drinks, transport etc. It’s worth noting that businesses do get a tax-free allowance for staff events that comes in at £150 per person but there can be quite severe penalties if you go over the limit, which is easily done. The staff Christmas party has a reputation for people over-indulging and this I often used as a punchline but it can have some real-world consequences for business owners. It’s very common for employees to over-indulge at these events and this can lead to inappropriate behaviour, confrontations and overall awkward situations. Any event that is organised by the company or employer is considered an extension of the workplace, even if it’s out of working hours. Therefore, the employer is still responsible for their employees when it comes to specific legislation- whether it’s health and safety, sexual harassment or discrimination. Suffice to say, a simple work event could potentially lead to a much more complex situation. Worst case scenario, any disputes or bad behaviour can spill in to the workplace or even lead to suspensions. It’s not just what happens during the Christmas party that can have an effect on business. There is a tendency for drinking too much which could lead to poor performance in work the following day or a spike in absences. Obviously, this has a knock-on effect and can lead to a loss in efficiency and cost the company even more. This may paint a bleak picture but there are ways for companies to hold an event without having to worry about all of these potential drawbacks. For example, if the party does involve alcohol then it would be best to limit the amount available as this reduces the likelihood of inappropriate behaviour and severe hangovers. Many companies are changing the way they celebrate altogether- moving on from booze filled parties to more activity-based events- such as craft days or something for foodies. You could also host trips out, such as to the theatre or cinema. Furthermore, some companies have forgone the Staff Christmas party completely, opting for smaller weekly or monthly communal activities. This takes the pressure off the business but offers the same benefits in terms of morale and team building. This entry was posted in Uncategorized on November 1, 2018 by Roland.